The meeting aimed to bring together stakeholders in Ethiopia dairy sector to discuss on improved dairy fertility management with specific focus commercial dairy farms and effective private AI services provision that is playing a vital role in fertility management and breeding in the country. The meeting ended with an advice to government in dairy breeding strategy development as well as advice from government to representatives of development partners including DairyBISS on best steps forward to support efforts for realization of improve breeding for dairy production in Ethiopia. Explanation being given on challenges and opportunities of AI from experience of NAIC. Three presentations were conducted, the first presentation which was made by Dr. Dereje director of Ethiopia National Artificial Insemination Centre focused on AI service provision from experiences of NAIC. He briefly explained challenges and opportunities in fertility management on dairy farms. The second presentation was made by Dr. Emiru Zewede, CEO ALPPIS (Addis Livestock production and Productivity Improvement Service). He shared the experience of his company challenges and opportunities in providing AI services for dairy farms. The third presentation was on experiences of commercial dairy farms by Wondirad Abraham Chair of the commercial Dairy Producer Association. He assessed AI services and challenges and opportunities in building the future generation of dairy cows. Explanation being given on and Q&A session. The platform shared and received various ideas and concepts and questions related to the topic from the participants and discussed certain solutions. Further strategies and plans were also conducted before the conclusion of the meeting. There is need to work on supporting the ministry on some specific details of the new breeding policy in its implementation phase. Support to design business models which trigger private sector involvement through time and which are able to take over fully the responsibility of government in providing AI services to the public. Conduct study and recommend business models how lead commercial farm or processing industry could provide embedded services which include AI for dairy farmers. Click here for a more in depth report. DairyBISS will organize the third round platform meeting on ‘Brewer’s grain and its importance for dairy production in Ethiopia. In the meeting in Addis on Tuesday December 12, opportunities and challenges in utilization of brewer’s grain in Ethiopia will be discussed by reviewing the current status and relating with best practices from international experiences. If you are interested to join, please contact our dairy business advisor Mr. Tinsae Berhanu via either +251911694257 and/or email: dairybiss@gmail.com. The project will undertake a Gender Study to get an insight as to which extend women owners and women workers of medium scale dairy farms, have equal access and control over the benefits. The further aim is to professionalise the advisory services by DairyBISS technical staff, by providing advice in a gender sensitive manner. – Analyse, during a data analysis workshop, the collected information with the technical advisors and draw lessons for the planning of extension and training activities for the last 8 months of this phase of the DairyBISS project. – Advise, on the basis of the study results, which further research concerning gender and medium scale dairy development is recommended for future support to medium scaled dairy enterprises. 2. Data analysis workshop and how to plan and provide technical advice in a gender sensitive way, 14 and 15 December 2017. Fieldwork will take place from 21 November till 8 December. The experiences with this (pilot) study, including the training aspects, can be made available to a larger group of DairyBISS technical advisors. The report on this study is expected in January 2018. The field trial on hay making with Holeta ATVET College was started in July 2017 and has been set up to improve on traditional hay production using little investments which would be affordable to local hay producers. In order to involve local farmers, farm advisers and agriculture students in the ongoing research process and to show them the ongoing activities during the research phase, a field day was organised on October 27th. The trial is conducted on two sites and compared to a similar site with no treatment. Whilst harvest of the trial plots and determining the final results will take place in a few weeks from now, the participants were clearly able to see the differences in growth between the different treatments. All research activities were explained by Merga Negassa of Holeta ATVET College. The clarifications given made it clear to farmers what is involved in improved natural grass productivity. The trials were appreciated by all the parcitipants as it gave them an insight into how productino of natural grasslands can be improve. For the students involved, it was a very interesting exposure to the implementation of an applied research project. The final results of the trial will be worked out soon and communicated to all stakeholders in dairy development in Ethiopia. 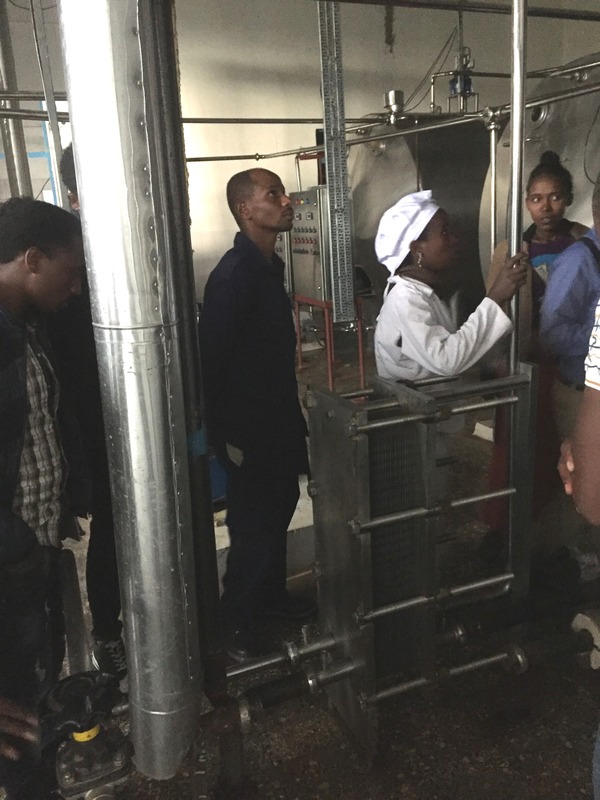 DairyBISS, as part of its capacity building program, has been training advisers working in the dairy sector of Ethiopia under three specialization scheme: dairy production, dairy processing and business development. This module based training is designed on a practical basis including a coaching session after completion of each module delivered through the collaboration of both international and local experts. This was realised mainly through the partnership made with Ambo University in developing content, coordination and certification. DairyBISS has also made the commitment to engage the advisers after the training to build their professionalism and future prospect by creating a platform on which advisers can network, collaborate and create synergy in addition to show casing their talent to the dairy sector. Therefore, DairyBISS, together with representative of the dairy advisers network (DAN,) has organised a networking at Azeeman Hotel in Addis Ababa today. An afternoon event whereby advisers, representative from the producer, processing and feed association were present. Project partners like Land O’lakes and SNV, Ambo University, commercial farms and firms attended the program. The program started by the welcome speech from DairyBISS followed by an introductory session. The guest speaker David Maina from Perfometer Kenya gave a speech on success and challenges of building an advisers profile specific to the dairy sector. He also shared his experience on how to build contact base, partnership and skills on working together as advisers. Two adviser from the dairy production and business development specialization made a presentation on their experience in the sector after the training, highlighting their achievements, challenges faced and prospects in the current environment of the Ethiopian dairy sector. The committee found the lead DAN into a formalized organisation reported on progress of the assignment, illustrating the vision, mission and goals envisioned for the future. The formalities of the afternoon were closed by entertaining questions from the audience to continue to the networking session where participant exchanged contact and knowledge and enjoying the refreshments. Almost all hay production in Ethiopia is done on natural pastures without any fertilization. But simple pasture management practices including fertilizer and manure application and also right timing during harvest could improve on the quantity and quality of pasture for hay. Therefore, DairyBISS started a trial in close collaboration with Holeta TVET to aim at quantifying the differences between the traditional hay management practices and new fertilization practices. This trial is a complete randomized design with five treatments and four replicates. both fertilizer and manure applied with two times cutting. The trail is ongoing at Holeta and will last until November this year. Friday September 8th, 19 new dairy advisors have graduated for the dairy production training organised by the DairyBISS project. The certificates are handed over by Mr. Jan-Willem Nibbering of the Netherlands Embassy to Ethiopia. In July, 13 dairy business advisors already received their certificates. With a presentation of their final practical assignment, the dairy production advisors graduated for the second round of the DairyBISS’ dairy production training. The training took place between January and July and consisted of 6 training modules, including housing, feed and fodder, young stock and record keeping, health, fertility and breeding, and farm economics. The training includes theoretical as well as practical exercises in which the trainees are asked to put their advising skills into practice. The DairyBISS project aims to contribute to the improvement of commercial dairy farming in Ethiopia. Currently the increasing demand for dairy products in urban areas is stimulating investments in the development of medium and large-scale dairy farms. However, proper knowledge and skills to manage these larger farms is hardly available in Ethiopia. That is why DairyBISS commenced a training program for technical and business advisors with special focus on practical skills and coaching. The technical advisors are trained in all practical aspects of dairy farm management. The business advisors learn to develop and to evaluate investment plans in the dairy sector for milk production as well as milk processing. 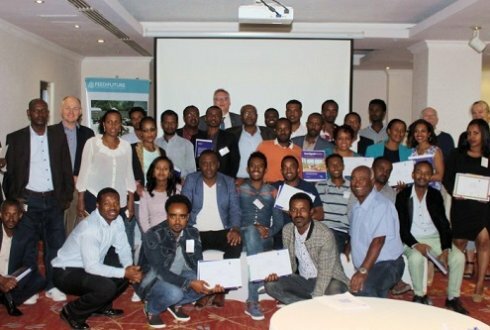 In July, thirteen dairy business development advisors received their certificate in the second training programme for dairy business development, a joined training program of DairyBISS, AGP-LMD and Ambo University, conducted from March to July 2017 based on eight modules succeeded by coaching on practical assignments that were linked to each module. Marc Steen, the chief of party AGP-LMD, stated during the graduation ceremony in July: “The demand for quality business development services by value chain actors is growing along with increasing willingness to pay for quality product/services. This training is key step to enable business development service providers to be responsive and effective for the new prospect of the sector”. Dr Mulugeta Negeri, Dean of collage of agriculture and veterinary science of Ambo University, added “The dairy sector cannot properly develop if business development services are not strong and proactive”. providers. The next meeting of the network will be on September 26 in Addis Ababa. Besides the dairy production and business development training programmes, DairyBISS is developing a specific training programme for dairy processing. The training will be executed at the end of 2017. We wish all Ethiopians, and especially everybody who is involved in dairy, a very happy and blessed 2010! The DairyBISS project is celebrating the completion of the second round of dairy production training designed and deliverd to Dairy Production Advisers. The graduation for these dairy production advisers will be on September 8th, 2017 at the Harmony hotel, Addis Ababa from 3 to 5 pm. This course introduces the steps required to design a programme for breeding animals and teaches the genetic and statistical concepts that are needed to build a solid breeding programme. For more information about this course and to register for the free online course on breeding, please visit http://www.wur.nl/en/Education-Programmes/online-education/MOOC/animal-breeding-genetics.htm. This is an exciting time for DairyBISS because we are establishing the Dairy Adviser Network (DAN): an association of advisers led and run by our trained dairy production and business development advisers. We hope that the skills, knowledge and experience gained through the DairyBISS project has added values in their every day work and created wider possibilities to a higher level. The main goal of DAN is to provide a platform for collaboration, networking, sharing of information and strengthen the member advisers to promote themselves and more. Through DAN we believe that we can create synergy to achieve their targets faster, more efficient and broaden their contact to build their professional carrier. Committee members are nominated and on July 18th the committee meeting was held at the DairyBISS office to discuss on ownership, organization, activity and sustainability of DAN. DAN is going to build a promotional portfolio on Facebook with good practices that has been done on client farms. On July 5th – 7th the Dairy Economics trainings was held for the Dairy Production advisers. On the first day there was a general introduction about the concepts of economics and the importance of considering economics in making farm decisions. Participants had an Excel exercise to see how some farm management practices (such as calving interval, age at first calving, feed selection, etc. ), could influence farm profitability. On the second day, participants were introduced to a list of indicators which they could collect in order to assess the performance of dairy farms. They were split into four groups and each group visited one farm from which they collected these farm indicators. After that they had some calculations on cost of production and other profitability indicators. Participants worked in their small groups to define the best management practices which would improve on the farm profitability of the farms they visited. The group outcomes were presented on the last day with some interactions an good discussions between the different groups and with the trainers. Some last indicators for benchmarking dairy farms were presented after the group presentations and finally, there was a presentation to guide participants on how to convince farmers to adopt changes which could improve on their profitability. Innovation Call ENTAG will be advertised soon! The objective of the Innovation Fund is to promote innovations in various agricultural sub-sectors in Ethiopia that benefit smallholder farmers. The Innovation Fund will provide matching grant funding for innovative projects, with a maximum grant contribution of €25,000. Projects are considered innovative when they introduce new or improved products, services, technology, business models and/or service delivery model to the country. Projects that take place in the poultry, aquaculture, legumes, spices, sesame, potato and dairy sub sectors are eligible for co-funding. Read more soon how to apply! Saturday July 15th, the second tailor made training on hoof trimming took place at Nardelli Farm in Debre Zeit. During the recent training for business developers, held between May 30 and June 2 in Addis Ababa, Mr. Jelle Zijlstra, Dairy Economist at Wageningen Livestock Research in the Netherlands, focused during his lectures on different areas in a dairy farm. The main objective of this block was to improve the skills of business advisers in understanding and analyse of how dairy farms/firms should be structured and managed to maintain and/or improve their business performance and to achieve that some key issues will be discussed and analysed how farms/firms could. The first focus area was to understand the production system of a dairy farm. This is a precaution to evaluate a dairy farm business and to recommend on improvements on technical and economic indicators. The second item was understanding of the costs of production. In this lecture cash flow, profit and loss account were explained. Understanding of the opportunity costs of a dairy farm offered different views on production costs. Each of these views is suitable to express different characteristics of costs, revenues and profit of the production process. The third item was understanding of the risks in dairy production and how to avoid and how to deal with these risks. Dealing with the risks of irregular demand during fasting seasons is a challenge for the Ethiopian dairy industry. The fourth item was about marketing strategy, followed by the application of a model to design a business plan. And the use of a value chain analysis as a tool to develop interventions that contribute to such a business plan. The fifth item was about understanding and calculation on the need of working capital. The final assignment at the end of the block was to optimize a dairy farm. Five groups applied what was learned during the training by estimating the increase in farm profit of better feeding, improved housing, higher milk quality, improved genetics and improved roughage management. On May 24th and 25th the Fertiliy and Breeding training for the dairy production advisers was organized at JeCCDO compound in Debre Zeit. Dr. Ulfina from Ambo University gave an interesting presentation on breeding. In the afternoon the cows at JeCCDO were examined and discussed. What kind of bull does fit to this kind of cow and why? What are the breeding goals you’re focusing on? The next day dr. Ulfina focused on artificial insemination and a video was watched about the details in practice. Mr. Wassink gave a presentation on the importance of fertility management. Afterwards the National AI Center in Kality was visited. On Thursday May 18th, 7 interested advisers joined the 2nd tailor made training on ration calculation for dairy cows. Some weeks before the first round took place in Addis Ababa with 5 interested advisers. A lot of practical situations were discussed. With a special developed Excel program different kind of rations were calculated and discussed. On April 26 – 28 the Health training for dairy production advisers was organized in Rosemary Hotel, Debre Zeit. Dr. Wagtole from Ambo University gave a great and detailed presentation on animal health. He described the current situation in Ethiopia, the vaccination program, the most common health issues, etc. In a meanwhile there was some time to discuss together. The next day Mr. Tessema gave an inspiring presentation on milk and milk quality in relation to animal health. His laboratory was visited and two different kinds of milk quality tests were showed. In the afternoon the NAHDIC in Sebeta was visited and a lot of information was given. An eye-opener to most of the advisers to cooperate with them. On the last day, Mr. Wassink gave a presentation on animal health around birth and how to handle preventive to avoid starting problems. After that Mr. Tamrat of EIAR tried to explain how to ‘read’ a cow: what signals is a cow showing and what does it tell about her? And what is she telling you to do? After lunch a dairy farm was visited to practice cow reading. On April 18th, a tailor made training on dairy ration calculation was organized in Addis for interested trainees of the dairy production training. Because of Easter there were only 5 trainees, so this training will be organized again in Debre Zeit. Please check the date on this website at Trainings and Events. A special developed calculation program is used during the training which includes the available feed stuffs and their values. This program is used to calculate with the most average starting points a ration that contains enough energy and protein for dairy cows. After some explanation of the program the trainees have to exercise in couples 4 assignments on ration calculation. Afterwards the possible solutions are described and discussed and in a meanwhile there are some interesting discussions on feed issues. Please find our quarterly news update here. To subscribe, please let us know by email. DairyBISS is planning to send a quarterly news update about the DairyBISS project to all key stakeholders. You will receive it this week when you are in our contact list. When you also do want to receive the news update, please send an email. Jettie Veerman, student animal husbandry at the Aeres University of Applied Sciences in the Netherlands will be do doing a field survey on calf rearing practices on commercial dairy farms in Ethiopia from April 4th till May 26th. She will do her field work together with the advisors of the technical training programme. Main objective of the study is to analyse current calf rearing practices on commercial farms in Ethiopia and advice DairyBISS on improvements which can be incorporated in our training programmes. Last week the Young Stock Rearing an Record Keeping training was organized for the dairy production advisors in Holeta. The Research Center was visited and their young stock examined. During the morning sessions the theory about rearing calves was discussed. Ato Tamiru from the National Arteficial Insemination Center explained about the record keeping system for the breeding bulls. Also the bull and dam farm in Holeta was visited. Interesting discussions on record keeping and young stock rearing were also part of the training. The first block of the new business development training took place last week in Addis. There were 200 applicants, only 15 were selected, including 2 women. The target of this training is to get high quality advisors for the dairy sector. Therefore, the specific focus of the training is on the dilemma’s in the dairy chain value.The first block was on identifying strategic options for dairy development interventions. Advisors were very satisfied with this first block: they rated 4.7 out of 5! Follow up will happen by coaching round and practical assignments. Next training block will be in the first week of April. The third and fourth block will be organized in May. The graduation will take place in the first week of June. In January the next platform meeting was organized on Milk Quality. A technical committee has been appointed by the Ministry and a meeting held with the Minister of Livestock on March 10th. A follow up meeting with all Associations from the dairy industry is organized for Monday 20th. Biggest challenge will be to get consensus on importance of milk quality. On December 1, the first group of trained dairy production advisors, received their certificate. The ceremony took place in the presence of representatives of Ministry of Livestock and Fisheries, the Dutch Embassy and some other donors. At the end of 2015, DairyBISS Ethiopia started a training program for technical dairy production advisors. Especially practical training and coaching is an important part of the training program. The advisors are trained on important practcal issues for dairy management. DairyBISS would like to announce the completion activities of the first round of the Dairy Production Advisory program: the assignments presentations on Dec 1st (for graduates only) and the graduation on Dec 2nd, 2016 (for graduates and invitational), 11:00 – 13:00 @ Ilelu Hotel, Addis Abeba. DairyBISS would like to announce the intake of the second round Dairy Production Advisors capacity building program. The training program will take approximately a year to complete consisting different modules. Upon successful completion of the training, candidates will have the knowledge, skill and attitude on major components of dairy production having the confidence to become competent ADVISORS. If you think you are interested to be an advisor in the dairy sector and have the required qualifications, please express your interest to these email addresses: dairybiss@gmail.com and liyagirmaabebe@gmail.com with the required documents. Make a note on the selection criteria points which are attached with this announcement. Successful candidates will be informed through email. DairyBISS look forward to hear from you! Client farm willing to participate in the training/coaching activity. Coming soon: announcement to apply for next round of Dairy Production training, part of Production Advisory Capacity Building Program, getting started January 2017. 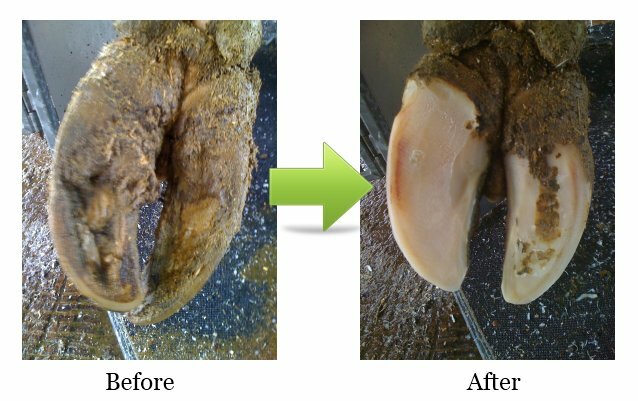 DairyBISS will organize a hoof trimming course for next week November 15 and 18, 2016. 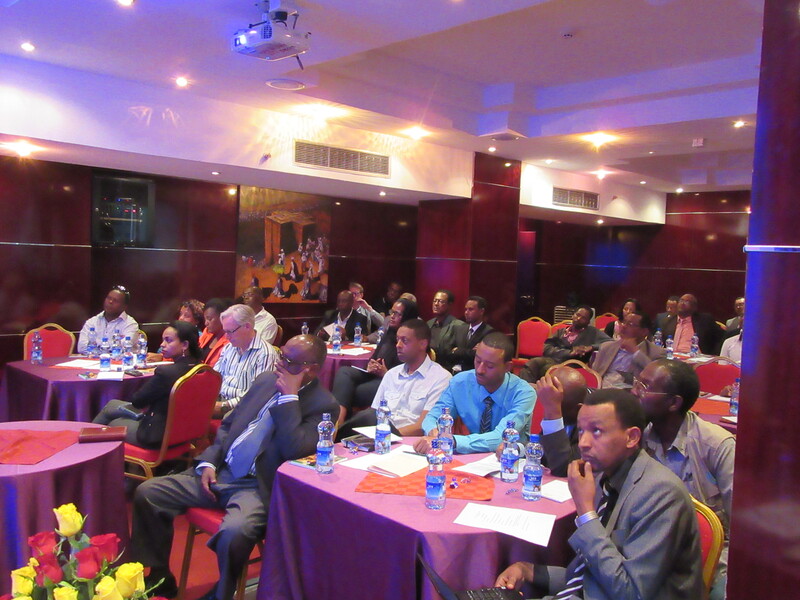 The Dairy Economics Training took place at Harmony Hotel in Addis. Mr. Jelle Zijlstra, Dairy Economist of Wageningen Livestock Research in the Netherlands, discussed in the morning of the first day the experiences with the checklists. After it, based on the comments, the checklist was modified. At the afternoon there was a farm visit organized. 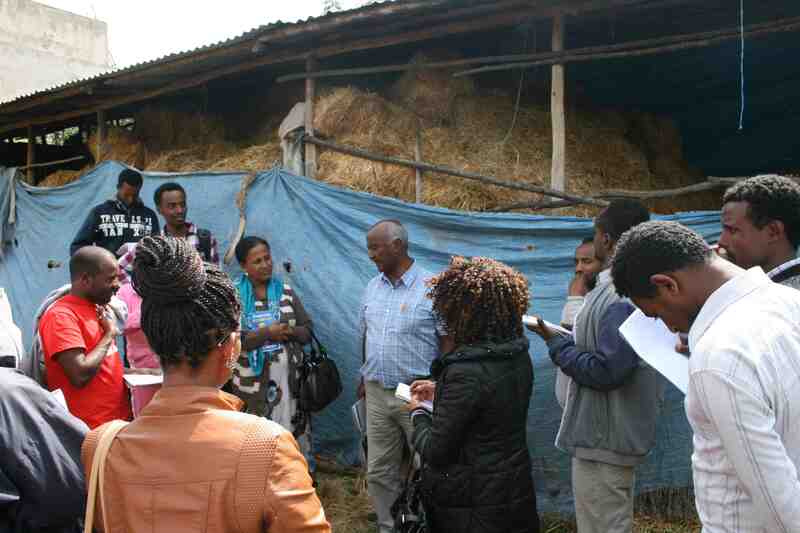 Knowledge gained in the morning was applied in practice on the farm of one of the participants in Addis. On the second day he taught about calculation of cash flow statement and profit and loss account. The impact of business adjustments for expenses and revenues were discussed and also the best practices to improve profit and the implementation of these economics on a dairy farm. In the afternoon communication and tools to improve this implementation were taught and discussed and a group photograph was made. Production trainings organized by DairyBISS for 2016. In 2017 a new group of advisors will be trained on Dairy Production. 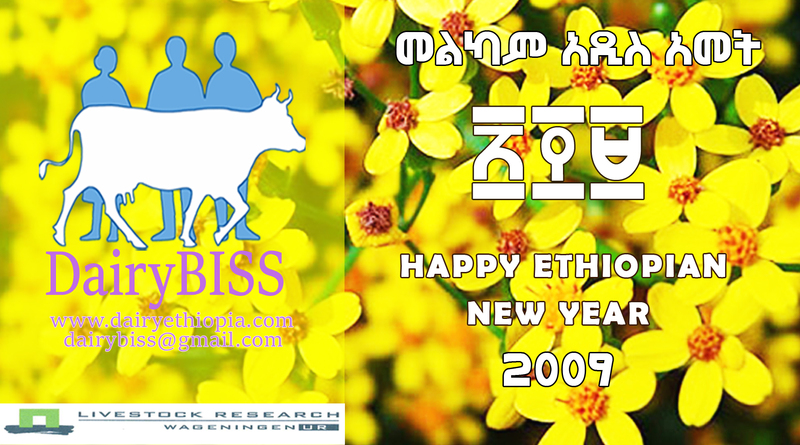 DairyBISS wish you a wonderful Ethiopian new year filled with abundance, joy, and treasured moments. May 2009 new Ethiopian year be your best year! 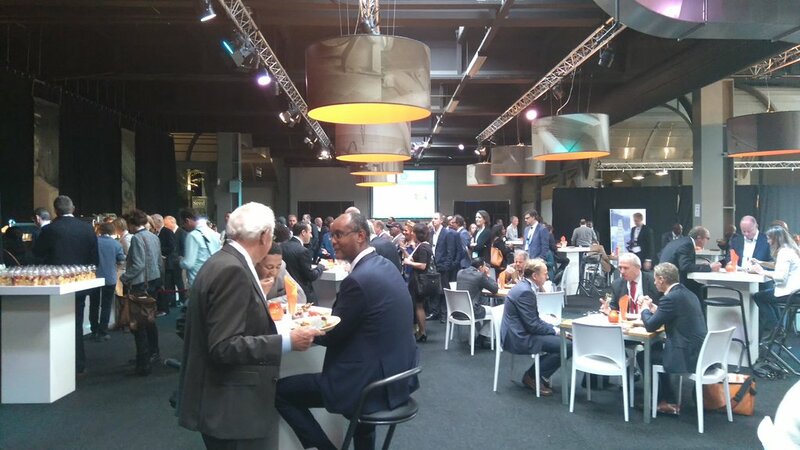 Several Dutch companies including knowledge institutes visited Ethiopia during the Netherlands-Ethiopia Trade Mission, organized by the Dutch Embassy and Ministry of Foreign affairs of both country. 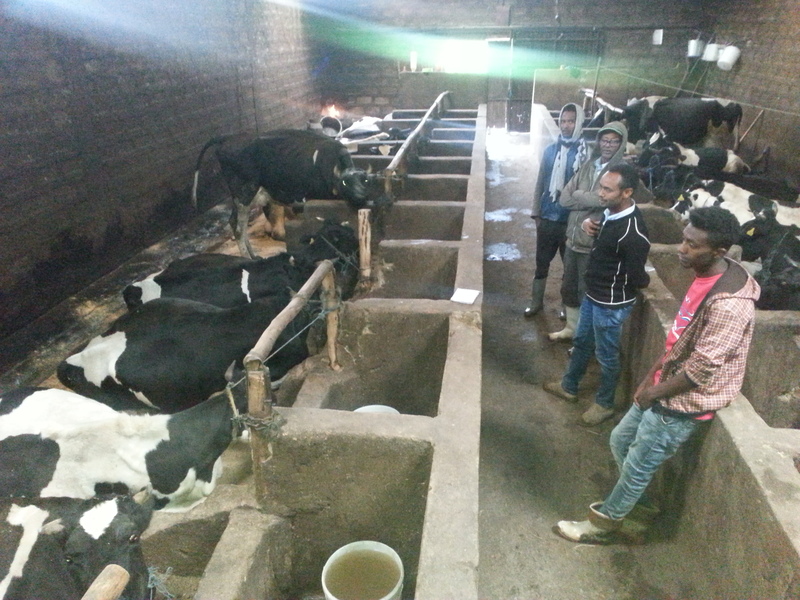 DairyBISS assisted mainly in the dairy sector where a significant interest was reflected to invest in Ethiopia to improve the existing situation in the dairy sector. “The potential of the Ethiopian dairy sector is huge”, said State Minister of Livestock Development and Fishery, Dr. Gebre-Egziabher Gebre-Yohannis during the seminar organised by DairyBISS on Wednesday May 18 at Radisson Blu, Addis Ababa. “But the dairy sector cannot properly develop if the private sector is not involved”. 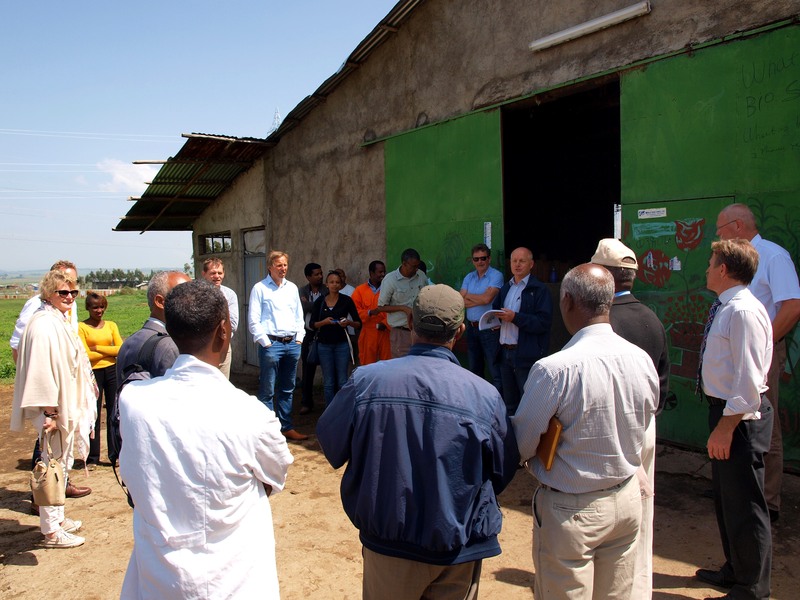 Therewith inviting Dutch companies to make use of the opportunities the development of the Ethiopian dairy sector has to offer, not only in primary production, but also in improving processing. Besides improving productivity and processing, a challenge for successful development of the sector is improving feed and fodder production. Adriaan Vernooij, part of the DairyBISS project, explained that in 1980, 30% of Ethiopia was covered by grassland, this was reduced to 12% in the year 2000, meaning there is less land available to feed cattle. In addition, feed quality is not sufficient, leading to inefficient productivity. Mr. Vernooij called for, among others, improving grassland management; better planting and seed material; and improving storage to prevent losses. Pierre Schonenberg of the Rabobank addressed the issue of access to finance, an important topic that was also discussed during a DairyBISS platform meeting in April https://dairyethiopia.com/news/. Mr. Schonenberg strongly recommended involving financers from the start of the project to ensure involvement and adequate knowledge. A major challenge for financial institutions to provide access to finance is the credibility of small farmers, who often lack a sound financial overview of their businesses. The DairyBISS project will take up this challenge to test innovative financial products in the dairy sector to overcome and learn from its findings. On the following day, DairyBISS organised dairy farm and firm visits by Dutch companies with a discussion forum with NGOs and government officials to understand the current situation in the dairy sector. Dairy farms and processing facilities’ in sululta: Kassa Abebe Integrated dairy farm, Loni Milk processing, Life Agro Industry and Elimtu Integrated milk processing factory were visited. The visit showed that Ethiopia has great potential for successful dairy development, if challenges are adequately addressed. This can be a reality through the cooperated effort of the private sector, knowledge and education institutes and the government. dairy education with Ethiopian Universities and ATVET. As part of the trade mission, education institutions from Dutch delegates and Ethiopian universities sat down for a morning session to brainstorm on the challenges in the dairy education and possibility of collaboration with the private sector. This session was organised by DairyBISS at the Radisson Blu, Addis Ababa with a follow up visit with some universities and ATVET for a more detailed discussion. The dairy sector needs skilled profession both in production and processing. Moreover the existing capacity of universities and ATVETS require further assistance to deliver the required outcome. Dr Mohammed (Jimma University) affirmed the importance of collaboration among universities in Ethiopia and Dutch as well as ATVETS to produce equipped students able to function both at a theoretical and practical level. It was forwarded by Ato Sintayehu (Hawassa University) that the private sector is going much faster than the education institutions pointing the fact that the first MSc in dairy processing was designed 55 years after the first processing unit was implemented in Ethiopia. Representatives from Ethiopia universities and ATVETs listed out the challenges facing the dairy sector in the education area as lack of practical skilled trainers and students as well as large class size makes it difficult to making learning sessions practical. The weak linkage between university and private sector including the community to facilitate for example internship and research possibilities was a point most mentioned. The apparent disconnect makes it difficult to gear the teaching to a need based learning system. The audience brainstormed on possible solutions, an outstanding point is to have a centre of excellence that demonstrate best practice and create possibilities for universities and ATVET to share experience among themselves and the private sector. Moreover collaboration of training centre by creating a bilateral arrangement between education and private sectors which could be a way to attract research and internship programs in the private sector. The idea was welcomed by many participants and high degree of willingness was expressed by Jimma University, Hawassa University, EMDIDI, Haramaya and others. Moreover a point was made that assistance from the Dutch education institutions would facilitate the change and implementation process. The Dairy sector and financial institutions realize the need for a closer collaboration to develop new finance models that can support the development of the Ethiopian dairy sector. This was agreed by representatives of prominent banks, insurance companies and the dairy sector who attended the 2nd dairy business platform meeting in Addis Ababa on April 7th, 2016 organized by DairyBISS. ‘Closer collaboration with financial institutions is needed to enable successful developments in the Ethiopian dairy sector’, said Jan van der Lee, project manager of DairyBISS Ethiopia. However, banks claim that often sound financial information of dairy business is lacking, especially with start-up businesses. This makes it difficult for banks to make evidence-based decisions on providing financial credits to farmers. ‘DairyBISS will start investigating possibilities for new financing models, together with financial institutions and the dairy sector’, announced Van der Lee. The current credit crunch prominent in the country has created a grim situation for investors and business owners by disrupting the continuous flow of product along the value chain. DairyBISS organizes two technical trainings for Ethiopians active in dairy production and processing this week. The first one deals with dairy production with a focus on housing. The second training deals with technical maintenance in dairy processing. The trainings are part of a six-month training & coaching program on dairy business development for Ethiopian livestock sector advisors. 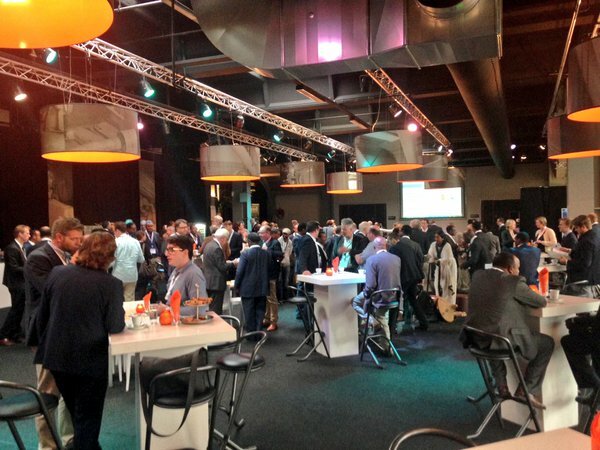 Ethio-Netherlands business to business event, November 5-6, 2015. 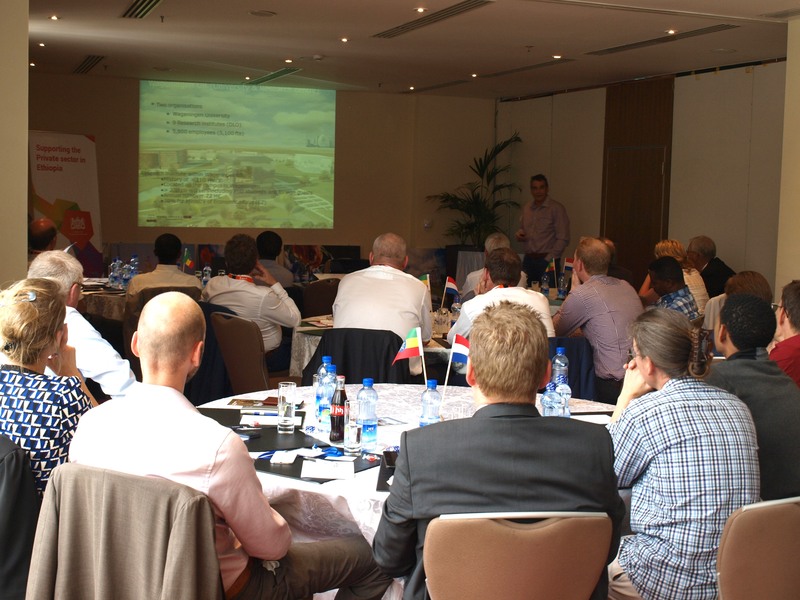 On October 6, 2015 the first dairy business platform meeting was held in Addis Ababa. This meeting united 25 enthusiastic dairy professionals working along the entire dairy value chain to discuss the main challenges in the sector and how to move forward through a platform. The dairy business platform is an initiative from the Dairy Business Information Service and Support (DairyBISS) project of Wageningen UR Livestock Research and Fair & Sustainable Ethiopia. It is one of the main strategies of the project in supporting the commercial dairy sector in Ethiopia. During the platform meeting the objective and strategies of the DairyBISS project were presented. This was followed by a validation exercise on the preliminary results of a baseline study conducted in September 2015 for which farmers, firms and advisors in the dairy sector were interviewed. Finally business opportunities in the dairy value chain in Ethiopia were presented. The presentations were followed by group discussions on, among other things, how to further shape the functioning of the dairy business platform. After the dairy business platform suggestions made by participants were included in the baseline report and the DairyBISS team has set out to form a task force to create a governance structure for the dairy business platform. For more information about the first dairy business platform meeting you can find the proceedings here.